Founded as “Satva realty” by Mr Vikas Shah, and now known as ADDOR REALTY, the company harnesses it’s efforts in the direction of creating immense possibilities and services beyond expectations. 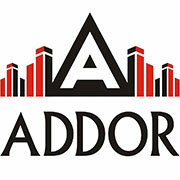 Addor Realty is the outcome of inherent creativity and focus on development through innovation. With offices in Ahmedabad, Mumbai and London, Addor has truly gone international. We have garnered a good presence in India and abroad and we are enjoying wonderful reviews of our work. Under the tutelage of Mr Vikas Shah, the company has grown and successfully executed projects in various sectors of development, commercial as well as residential; plotted developments, infrastructure projects; efficient office spaces and lavish villas. Addor believes in designing and creating lifestyle products rather than boxed spaces. We work towards elevating the lifestyle needs to a new level of positive human experiences. Our focus towards future growth is to establish ourselves as a unique development group, with a very strong corporate identity that amalgamates quality and delivery as paramount pillars of infrastructural development.